"A Rich Man's war but a poor man's fight"-- a wealthy man who was drafted could hire a "substitute" to fight in his place. The confederate Congress needed every man available so they abolished the practice in 1863, but the Union let men find a substitute if they could pay $300. Some men who did not fight made their fortunes during the war. Andrew Carnegie, J.P. Morgan, John D. Rockefeller, Charles Pillsbury, George Pullman, Jay Gould, and Marshall Field are examples. Some of these men paid a substitute to take their place in the army. Read The Mostly True Adventures of Homer P. Figg by Rodman Philbrick! "Bonnie Blue Flag" was a popular Confederate marching song that told the story of the order in which the Southern states seceded from the Union. The song was based on the flag of the same name, whcih was the first used by secessionists. Later in Margaret Mitchell's famous Civil War saga Gone with the Wind, Rhett Butler and Scarlett O'Hara name their daughter Bonnie Blue. Read Gone with the Wind! According to U.S. military records: 127 Union soldiers 13 years old when they enlisted. 320 soldiers were 14. Nearly 800 were 15 years old. 2,758 were 16. And about 6,500 were 17 years old. There are no numbers regarding the ages of underage soldiers in the South, but historians believe the numbers were higher. Check out Charley Skedaddle by Patricia Beatty or Rifles for Watie by Harold Keith. 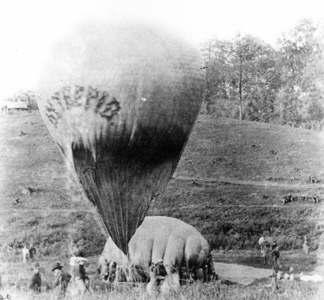 Hot air balloons, or observation balloons were sometimes used to report troop movements and battles. Read Lincoln's Flying Spies by Gail Jarrow!